Alex Harris is a world-famous rock star, lead singer of the Internationally acclaimed band The Waterdogs. But Alex is no ordinary rocker, he has a secret that he and his family have painstakingly kept since Alex was ten years old. This is the story of him, and his life, growing up with his parents and his elder sister Annabel whilst coming to grips with a strange condition. Follow them as this Journey twists and turns its’ way through tragedies, heartbreak, intrigue and into the clutches of organized crime. I am going to be blunt. 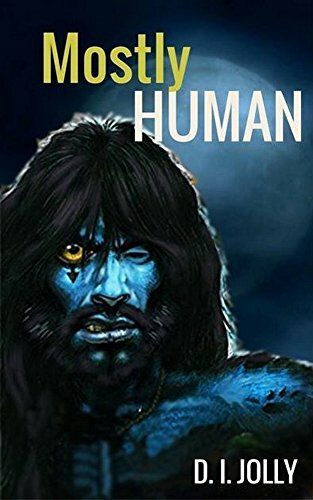 The cover of Mostly Human does not show the awesome story that is beyond the cover. If I were browsing on Amazon and saw this, I would pass on by. My suggestion to the author would be a new cover that reflects the story. Because Alex looks like he’s part zombie and the picture of Annabel in the background doesn’t do her justice….at all. I really liked that the book was told in 3 parts. Alex as a child, Alex as a teen and Alex as an adult. I think that it fully showed how being a werewolf affected Alex at each stage of his life. As a child, he couldn’t do sports anymore (because of his strength and speed) and he had to adjust to being a werewolf. He couldn’t get his heartbeat up, get upset in public or do anything that a normal tween that age would do. He had to learn to live with his wolf which was achieved through breathing exercises, meditation, and Tai Chi. As a teenager, Alex had to learn to deal with typical and atypical situations as both a teenage boy and as a teenage werewolf. While he was dealing with changes, an awful thing happens and Alex blames himself. Actually, blames himself to the point where he starts looking for a cure so he could be normal again. I wanted to cry during his scenes with his grandfather and grandmother when he went to live with them to get over what happened. That was the saddest part of the entire book. The guilt he had was very overwhelming. As an adult, Alex was successful, a great brother/son/uncle and still was a werewolf. He explained his absences during the full moon as a “medical condition”. I do think that he still struggled with being a werewolf at times but it came across that he accepted it. He also came across as a bit of a player. His relationships didn’t last beyond 3 months and when he wasn’t exclusive with a girl, he was sleeping with a different one each night. That was probably the only thing I didn’t like about the book. The end of the book ended with a cliffhanger and it made me scream. If you have followed my blog for any time, you know that I don’t care for cliffhangers. While I see their purpose, they annoy the ever-living out of me. Saying that this cliffhanger does make me want to read book 2 when it comes out. I need to find out what happens to Alex!! Why: Mostly Human was a different take on the typical werewolf story and it definitely appealed to me. The plot was fast and engaging, the characters were 3 dimensional and there was plenty of action.